Cook rice according to package directions (rice can be cooked ahead and used in this recipe later). Cut the zucchini crosswise into the thick, equal parts. Spoon out the seeds. 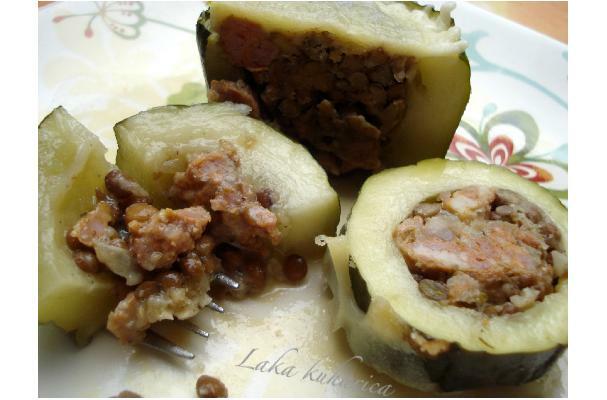 To shorten the baking time in the oven, zucchinis can be pre-cooked in a microwave oven: put the zucchini in a microwave- proof dish and add very little water. Cover and cook 10 minutes at max. Drain and set aside. Squeeze sausage out of the casing into the pan with hot oil and cook until it's lightly browned, breaking apart with the back of the turner. Add onion and sauté for 3 minutes over medium heat. Add oregano, cumin, salt and pepper, sauté 2-3 minutes to blend the flavors. Add rice, lentils and Parmesan cheese, stir and cook for 2 minutes. Remove from heat. Place hollowed-out zucchini in a baking dish thinly coated with olive oil. Stuff the filling mixture into the hollowed-out zucchini, using a spoon to press the mixture down so it's tightly packed. Bake in the oven at 200ºC for 30 minutes if the zucchini has been pre-cooked in the MWC, or for 45 minutes if they are not pre-cooked. About 10 minutes before the end of cooking remove from oven and put a generous pinch of grated mozzarella on top of each zucchini. Put back them back into the oven and bake until cheese is melted.